"A Bluegill Sunfish Sculpture art edition." Artist Edition: 7 x 10 inches long. Remembering some of the finest simple fishing experiences! 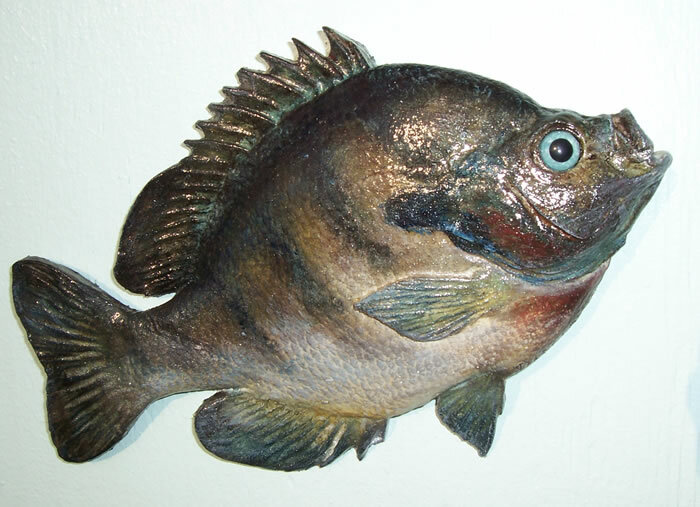 A Super realistic true to life size Bluegill Sunfish wildlife art sculpture, open edition. Bluegill Sunfish facing right. Hang on wall as single fish or schools of fish with quantity discounts. Can be re-created in larger sizes too. State of the art cast 'Poxy-porcelain©', a unique proprietary compound of high strength, durable and nontoxic artists' materials.  Custom, made-to-order items may require a non-refundable down payment. Bluegill Sunfish species facts info will be added here!.